Nicklaus North's Golf Tournament Packages for 12 - 24 players! GolfBC Group announces that it has closed on the sale of Furry Creek Golf and Country Club, including development land surrounding the golf course. GolfBC initially acquired the property in October of 1999. Future plans for Furry Creek includes further development of the residential community as well as building on the vision set for “BC’s Most Scenic Golf Course”. To ensure the smooth continuation of operations, the current team of managers and staff will be retained under the new management, who have also expressed desire to continue to grow the employment base in the region in their long-term vision for the Sea-to-Sky corridor. 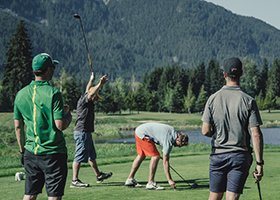 “We feel good about passing the torch on to the new ownership group, whose golf operations and development experience will serve to accelerate and further establish Furry Creek as a world-class destination and community along the stunning Sea-to-Sky corridor. We expect that their plans for Furry Creek will undoubtedly add immense value for all who are part of this special community”, says Christian Chan, Executive Vice President of Burrard Group, GolfBC’s parent company. GolfBC will continue to offer online tee time reservation services for Furry Creek through its website, www.golfbc.com, until the end of the 2017 golf season. Further announcements will be made in the coming weeks with regard to the transition and/or phasing out of corporate programs, gift cards and rewards program pertaining to the property. The company will continue to proudly operate all its other golf courses in British Columbia and Hawaii. GolfBC Group, Western Canada's largest golf course owner and operator, and its parent company the Burrard Group have been creating premium golf destinations and master planned golf communities since 1989. GolfBC is the owner/operator of seven championship golf courses in British Columbia, including Nicklaus North (Whistler), Gallagher’s Canyon (and The Pinnacle, a 9-hole facility at Gallagher’s Canyon; Kelowna), Olympic View (Victoria), The Quail and The Bear (The Okanagan Golf Club; Kelowna), Mayfair Lakes (Richmond), and Arbutus Ridge (Cobble Hill). The group also owns and operates the Gold, Emerald and Blue courses at Wailea Golf Club on Maui, Hawaii. In June of 2017, GolfBC announced the addition of the Blue Ocean Golf Club to its management portfolio, which is under separate ownership.